Upon solving a mysterious puzzle box, six complete strangers earn an invite to solve a state of the art escape room, and earn a $10,000 prize. For shy physics student Zoey Davis (Taylor Russell) it is a chance to challenge herself by stepping outside of the safe environment she has cocooned herself in since a past trauma. However Zoey spots similar signs of trauma in other competitors, from the scarred corporate alpha dog (Jay Ellis), to the acerbic alcoholic (Logan Miller), but doesn’t have time to wonder on the meaning of this, as it soon becomes apparent that each of the escape rooms is designed to punish failure with death. It’s hard to see a film fall apart as quickly and as miserably as Escape Room does in the last ten or so minutes of its run time. Yet in its attempts to set itself up for a string of sequels to follow, Escape Room stretches the bounds of believability far beyond breaking point, and into the ridiculous. Worse still, it’s ponderous while doing this, resulting in clunky dialogue, cliched scenes, and cribbing from other horror franchises (notably Saw). Which is a vast pity, as it wrecks what was until this point a rather solid horror film. Although Escape Room might be somewhat reminiscent of other films in the genre (The Cube, The Game), it brings with it a sense of style and rather competent execution, making up for some of those shortfalls in originality. Sure it’s easy to differentiate the main characters from the random collection of “red shirts” that will not survive the various death traps, due to their lack of extended introduction, and this does rob Escape Room of some of its tension. However it must be said that those that are “born to die” make some excellent use of their time on screen. 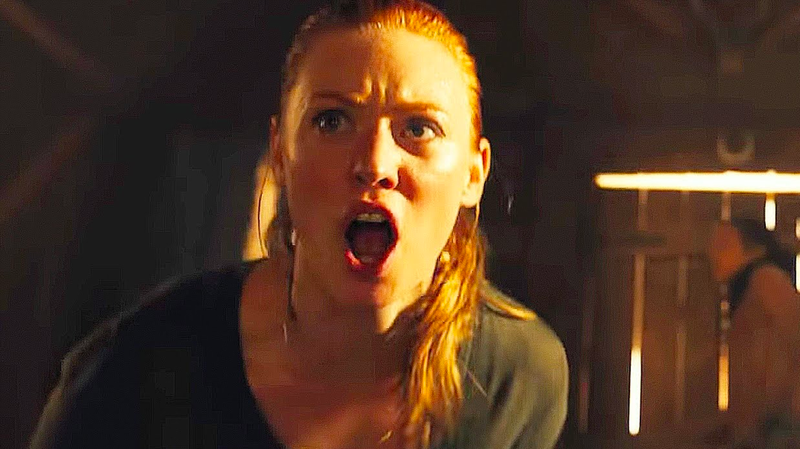 Deborah Ann Woll (Daredevil) as the traumatised ex-vet especially steals the show, but all of the actors make the best of their screen time, given the slight amount of characterisation that they are given to work with. Taylor Russell (Lost in Space) certainly deserves a lot of recognition, riffing on the Final Girl mold, and blossoming from shy retiring nerdy wallflower, to kick arse warrior princess with a plan (even if Escape Room does leave you wondering where she suddenly acquired Liam Neeson’s set of particular skills). Then there are the death traps themselves, and whereas they lack the brutal, simplistic savagery of Jigsaw’s designs, they are wondrously convoluted sets allowing for some great action pieces. From a waiting room that slowly converts into an oven, to a pool bar turned upside down, there is a perverse sense of insanity at play here, that allows for some beautiful design. These sequences are certainly the highlights of Escape Room, as the poor victims clamber to work out the fiendish puzzles set before them in an attempt to prevent a grizzly demise. At its best Escape Room proves it can be inventive, and create tension in its audience. Ultimately though, that tension is something that the film just can’t sustain, and it fails to deliver on its promise. For all that potential, a weak ending, and poor attempts to set up a sequel bury Escape Room more effectively than even Dexter could.